As a group we developed a creative way for teachers to introduce and reinforce the provinces and territories of Canada. We planned a scavenger hunt at Malden Park where we used the landscape, surroundings, textbook, and iPad for the students to solve clues. This also introduces the use of coordinate systems and how to use google maps. This activity can be adapted for any grade level and on a micro to macro scale. This activity is inquiry and discovery based in order to accommodate differentiated learners to be successful in achieving curricular objectives. 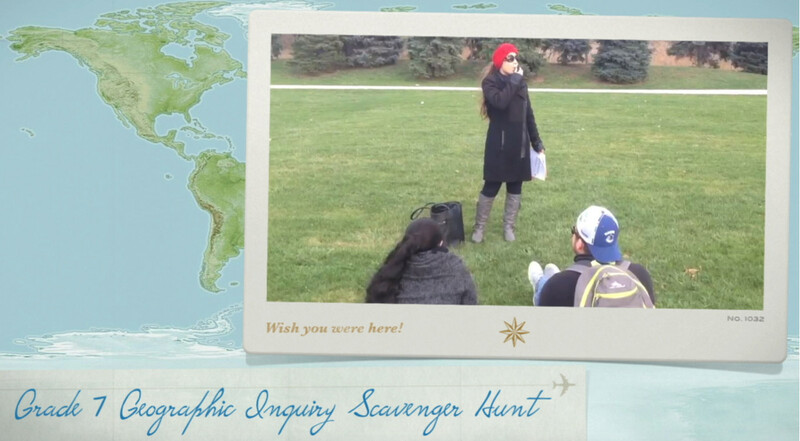 This video can be used in two fashions 1) as a teaching resource for the teacher to plan their own geographical scavenger hunt and 2) the video can be used as an introductory activity for the students to get excited about their own upcoming scavenger hunt. This particular scavenger hunt was created for a grade 7 class. Conti, B. Connors, C. Robbins, A. (1977). Gonna Fly Now [DeEtta Little] [Vinyl] Beverly Hills, California: United Artists Media Group. Draper, G., & French, L. (2000). Gage Physical Geography 7: Discovering Global Systems and Patterns. Vancouver: Gage Educational Pub. Randolph, B. Rich, S. (1963). Yakety Sax. [Vinyl] Washington D.C: Monument Records. Vacca, Richard T., and Jo Anne L. Vacca. Content Area Reading: Literacy and Learning Across the	Curriculum. N.p. : Pearson, 2013. Print.